Snowshoeing, ski touring, cross-country skiing and winter walking. It's all possible at Mt. Hoven. Loen Active offer guided tours. And when there is a Full Moon between November and February maybe we'll invite you for an unforgettable tour at Mt. Hoven. The evening sky is magnificent up here. Remember to stay safe, and read about safety in the mountains. We highly recommend to use a guide when exploring the mountains. 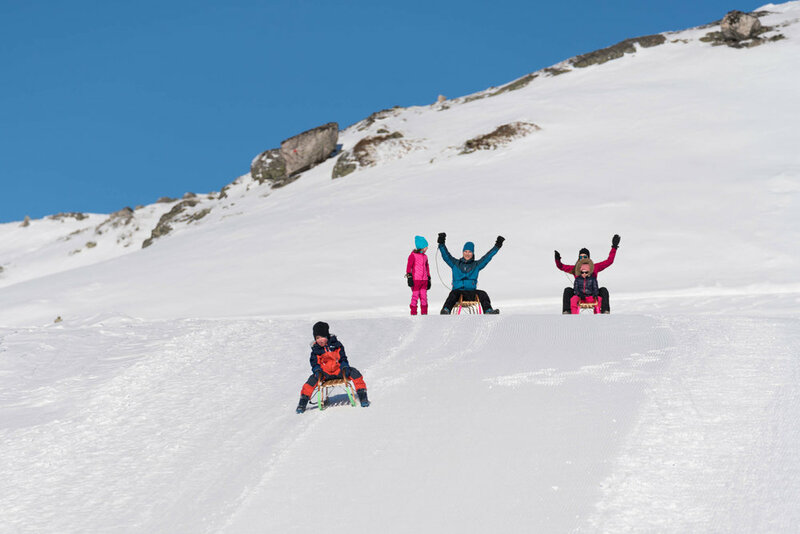 Try our fast-paced sledges at Mount Hoven. Rentral of sledge and helmet included. 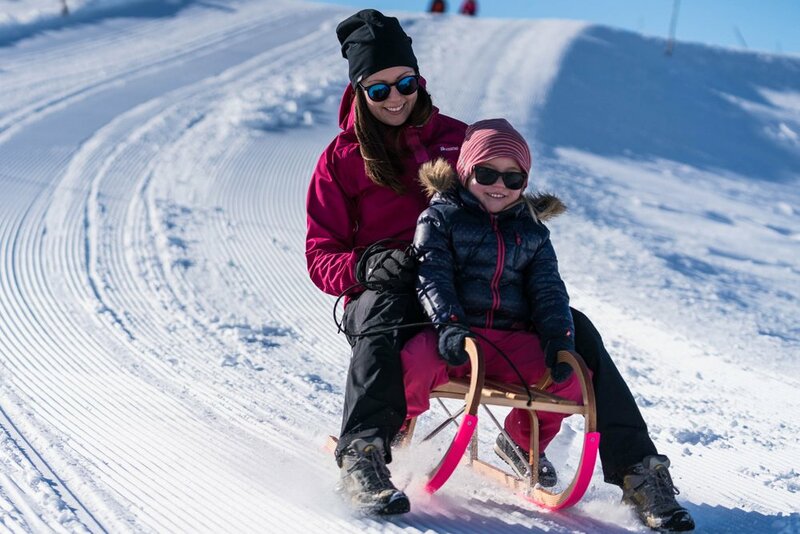 Enjoy the free and fun sledge slope at the top of Mt. Hoven for an adrenalin rush. 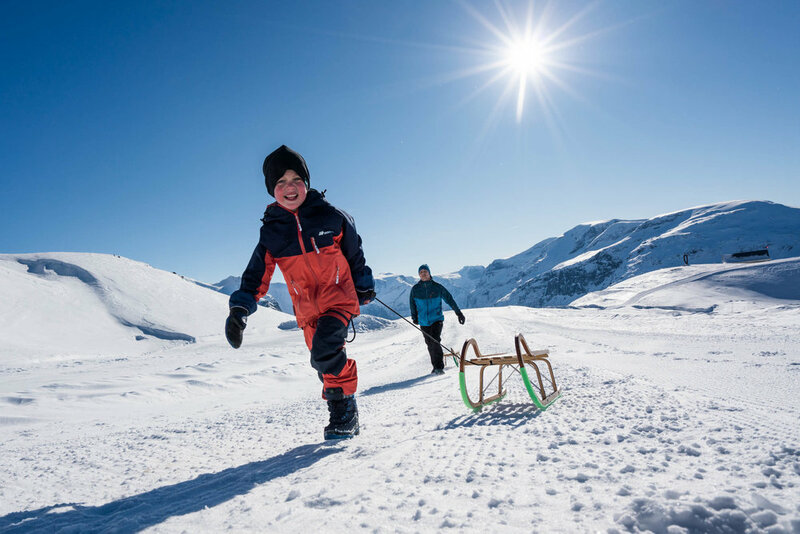 You can bring your own equipment or rent a sledge from Loen Active. Remember that a helmet is required. 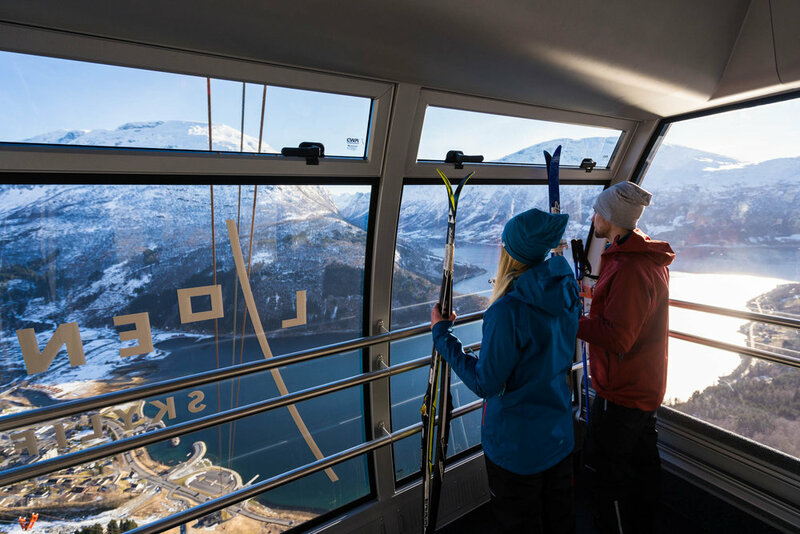 After spending our time in the snow, enjoy the view from Hoven Restaurant with something to eat and drink before returning to the lowland with Loen Skylift. All activity on the road to Oppheim is at your own risk. Check the avalanche bulletin, show consideration and adapt your speed. You may meet hikers, skiers, machines and people on snowsledges along the road. Please note that the construction road ends at Oppheim/Holme, and that there is 7 km left back to Loen Skylift. Parking at Holme (fee). Sledding include a certain risk, so we have made som general guidelines for visitors at Mount Hoven. Only one person per sled, unless you accompany small children. 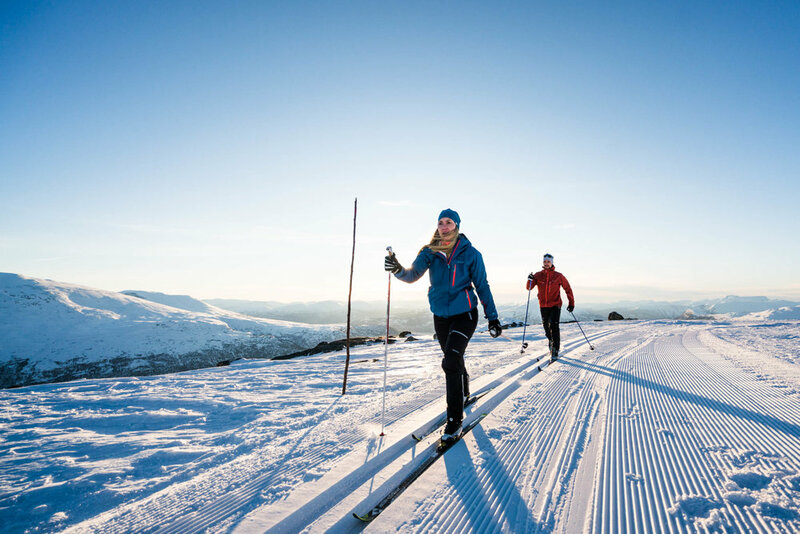 When the weather allows, we'll make groomed Cross-Country tracks with world class view of the fjord, mountains and the Jostedalsbreen Glacier. Tracks and length of tracks will vary according to snow conditions and weather. See status on our cross-country tracks on our live page. Remember to bring skiing equipment, warm and wind/waterproof clothes, hat and gloves. Instructor can be provided on request. We recommend lunch or a hot chocolate in Hoven Restaurant before the return by Loen Skylift. Explore the mountains on snowshoes - it's both easy and fun! 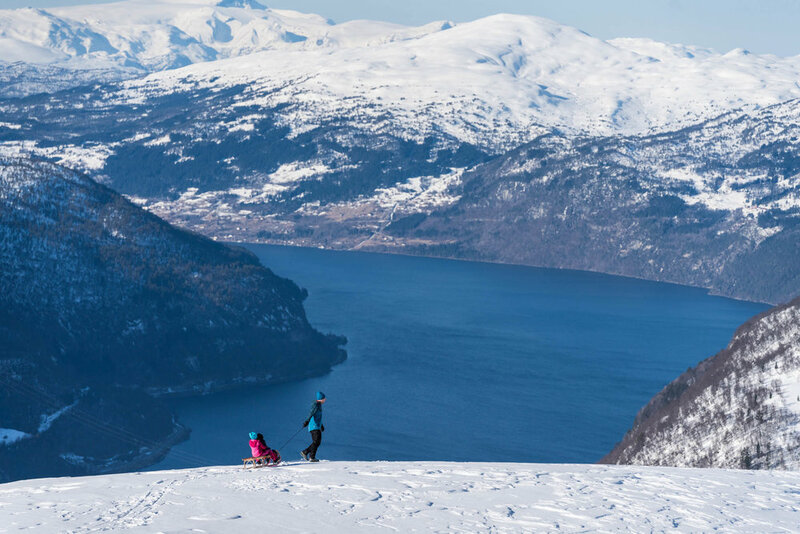 Explore the winter landscape by foot, 1011 meters above the fjord. There are many winter walking opportunities around Mt. Hoven, most offering fabulous views of the fjord and the majestic mountains. And it’s all so close, with only a spectacular five minute cable car ride from Loen village. 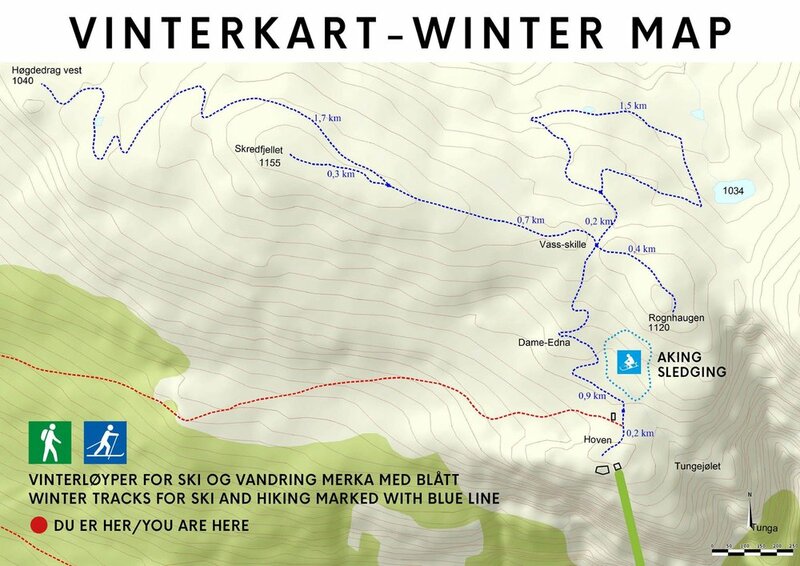 Snowshoes are preferred, but there are also 200-1000 meter long groomed trails in connection to Loen Skylift. Conditions depends on the weather. For a more safe and informative trip we offer guided trips. After your hike, warm up in the Hoven Restaurant. Maybe a hot chocolate by the fireplace sounds tempting? If you want to go on your own, you can rent snowshoes at Loen Active for NOK 300 per day or NOK 200 for four hours including rods. 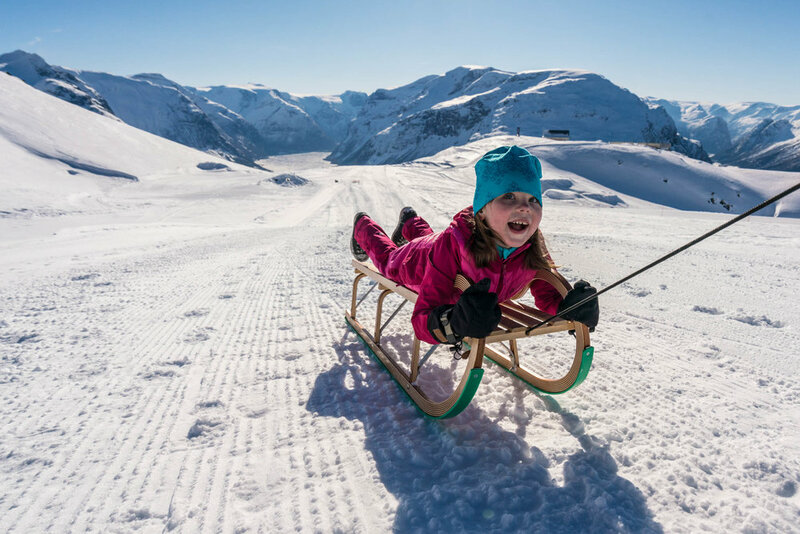 You can rent snowshoes in the fjord shop in Loen Skylift's opening hours, or in Loen Active's mountain shop on the 1st floor of the mountain station which is open Saturday and Sunday at 11:00-16:00. Payment by card only. 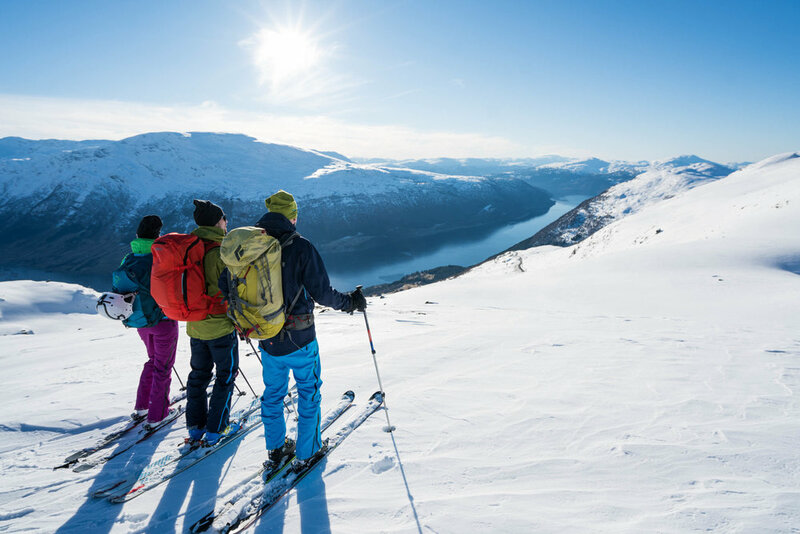 The mountains surrounding Loen and Stryn invites you to great ski touring and backcountry skiing with views of fjords and mountains. Our experienced guides will adjust the trip based on the weather and snow conditions. You have many summits to choose from, and even more downhill runs. Remember that that all skiing is on your own risk, and make sure you have the necessary skills for safe skiing, or bring along an experienced guide. Contact Loen Active for booking. Check the avalanche bulletin before heading out, and read the safety tips for Norwegian mountains. For guided ski touring Loen Active cooperate with the certified IFMGA mountainguides from Breogfjell. With mt Hoven as the point of the departure, a suite of alpine ski touring opportunities opens up. Most of the skiing in this area is in complex terrain and some descents are on glaciers. From the top station there is just 150 vertical meter ascent to Mt.Skredfjellet. 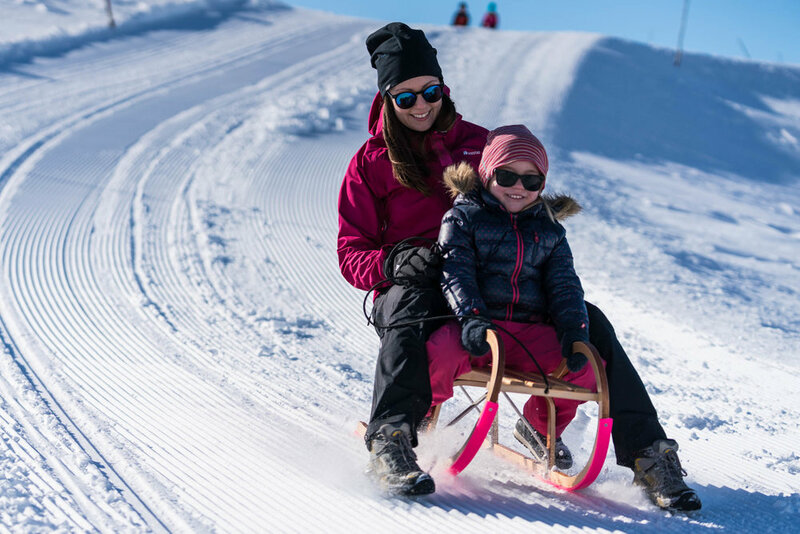 From here we can choose between several descents from between 300 vertical meters up to 1000 vertical meters, depending on the snow- and weather conditions. From the top station we continue up to Mt. Staurinibba (asc 400 vertical meters). From this peak we'll enjoy the stunning fjord view and prepare for the first 600 m descent towards Lohøgsætra. From this small summer farm we can either head back to Loen Skylift, go down to Loen Village, or go for a second ascent to Mt. Sundshyrna, Mt.Dispahyrna or Mt.Geitafjellshyrna. From these peaks we can drop down 1600 vertical meters to Stryn Valley. After a day you will have a total dsc of 2000 vertical meters with only 1400 m ascent.